Every bride-to-be wants to be beautiful and gorgeous on the big day. So It is necessary to purchase a fabulous wedding dress. There is good news that WhiteAzalea has a big promotion during this period. 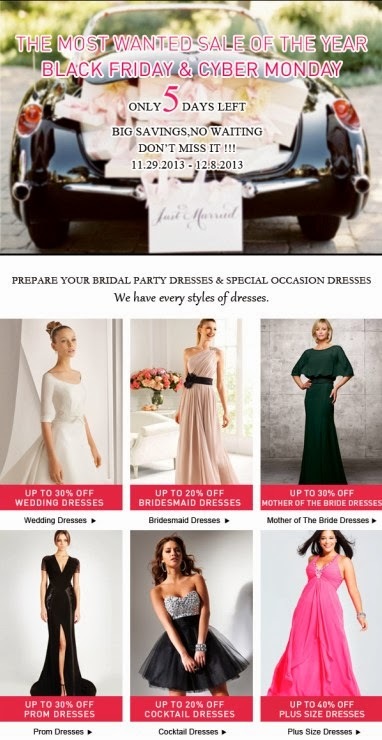 All customers can get a discount, 20% off for bridesmaid dresses and cocktail dresses, 30% off for Wedding dresses, mother of the bride dresses and prom dresses, and 40% off for the plus size dresses. And the promotion will last from November, 29, 2013 to December, 8, 2013. Excellent collections of wedding dresses in different styles, designs and colors are available in WhiteAzalea. No matter the maternity wedding dress or the normal wedding dress. All you can get from WhiteAzalea. You can also find different kinds of elaborate wedding dresses and special occasion dresses here. As the promotion for the Black Friday & Cyber Monday will be launched only 5 days left, what are you waiting for? Just take actions! Sizing the most wanted chance! Hope you can find the right gown that can best reflect your personality and the beauty of you.